Several 2020 releases of Autodesk products are making news today from Inventor to 3ds Max. Also making its public unveiling is the new AutoCAD 2020. 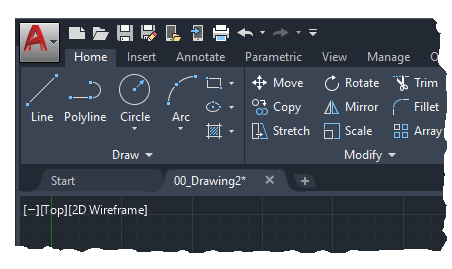 Read what is new in AutoCAD 2020 and then give it a spin by downloading it. when it becomes available for subscribers and trial download. The following is an overview of the changes made to the AutoCAD 2020 release. “AutoCAD 2020 provides a set of enhancements based on customer feedback, surveys, and analytic data that prioritize our efforts. Several features modernize and streamline frequently used features across many customer disciplines. Your user interface is obviously something that you use all the time. Past customer feedback repeatedly indicated that we needed to make significant changes to improve the clarity and crispness of the dark theme. Similar sharpening was also applied to the light theme as well. As you can see, we optimized the background colors with the icon colors to provide the optimum contrast without distracting from the drawing area, where you're usually focused. The highlighting of contextual tabs on the ribbon is now more distinct when active, such as when you edit text or create a hatch. Several methods for inserting blocks are currently available: Insert, Tool Palettes and DesignCenter. Having these different options available recognizes that people in different disciplines have different requirements and preferences. The primary reason for redesigning the Insert dialog box is to provide better visual previews of blocks in the workflow for inserting blocks. The palette increases efficiency for finding and inserting multiple blocks-including the new Repeat Placement option, which can save you a step. 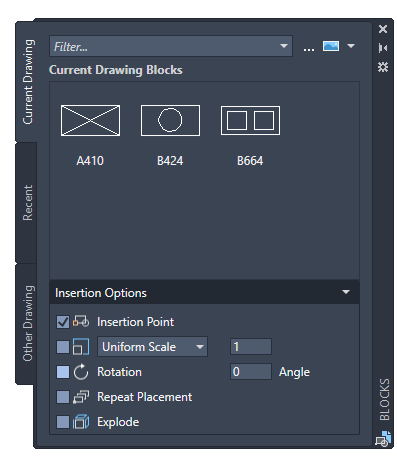 The Current Drawing tab displays all the block definitions in the current drawing either as icons or as a list. The Recent tab displays all the most recently inserted blocks regardless of the current drawing. These persist between drawings and sessions. You can remove a block from this tab by right clicking it and choosing Remove from Recent List. The Other Drawing tab provides a way of navigating to folders from which you can choose drawings either to insert as blocks or to choose from the blocks defined in those drawings. These drawings and blocks also persist between drawings and sessions. The top of the palette includes several controls, including a field for applying wildcard filters to the block names, and several options for different thumbnail sizes and list styles. Home tab > Block panel > Insert. Access from the ribbon provides a gallery of the blocks available in the current drawing together with two new options, Recent Blocks and Blocks from other Drawings. 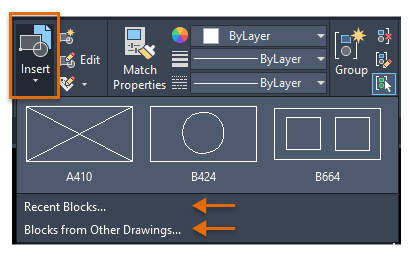 These two options open the Blocks palette either to the Recent tab or the Other Drawing tab. The Current Drawing tab in the Blocks palette displays the same blocks in the current drawing as the ribbon gallery. Placing blocks from the Blocks palette can be accomplished by dragging and dropping or clicking and placing. BLOCKSPALETTE - Opens the Blocks palette. BLOCKSPALETTECLOSE - Closes the Blocks Palette. CLASSICINSERT - Opens the classic Insert dialog box. INSERT - Starts the BLOCKSPALETTE command except in scripts, which open the legacy INSERT command for script compatibility. -INSERT - Starts the command line version of the classic INSERT command. BLOCKMRULIST - Controls the number of blocks displayed in the Recent tab of the Blocks palette. BLOCKNAVIGATE - Controls the file and blocks that are displayed in the Other Drawing tab of the Blocks palette. Takes effect the next time you start the program. 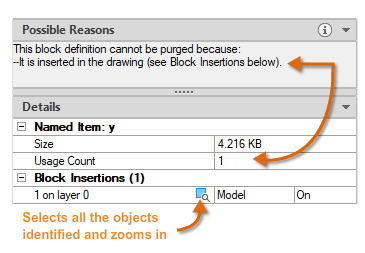 BLOCKREDEFINEMODE - Controls whether the "Block- Redefine Block" task dialog box is displayed when inserting a block from the Blocks palette with the same name as a block inside the current drawing. BLOCKSTATE (Read only) - Reports whether the Blocks palette is open or closed. 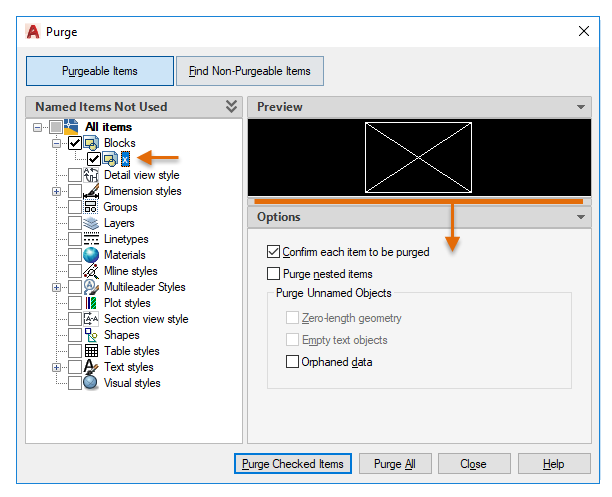 The Purge feature has been revised for easier drawing cleanup and organization. The control options are nearly the same, but the orientation is more efficient and the Preview area is now resizable. Notice that you can now purge zero-length geometry without purging empty text objects. Check boxes in the Named Items Not Used panel provide a way to select purgeable items by category as well as individual items. The Find Non-Purgeable Items button displays information specific to why the checked item cannot be purged, which will be helpful in many cases. For objects that can't be purged, the new design provides enhanced information as shown below, including the number of objects on each layer and their impact on file size. The Select Objects button shown in the illustration below, zooms in on the specified objects that can't be purged. Manage tab > Cleanup panel > Find Non-Purgeable Items and Purge. These two controls determine whether the Purgeable Items or Find Non-Purgeable Items display when the Purge dialog box opens. PURGE - Opens the redesigned Purge dialog box. 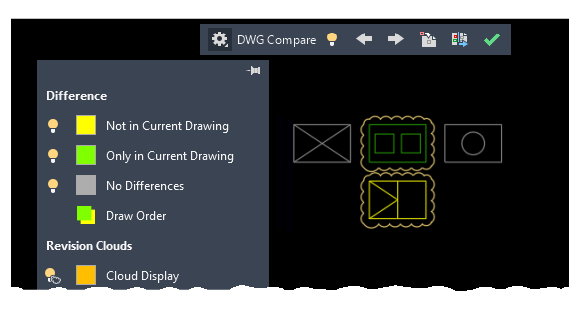 The primary enhancement to the DWG Compare feature is that you can now directly compare and edit the current drawing together with a specified drawing while in the compare state. The comparison takes place in the current drawing. Any changes you make in either the current drawing or the compared drawing are dynamically compared and highlighted. 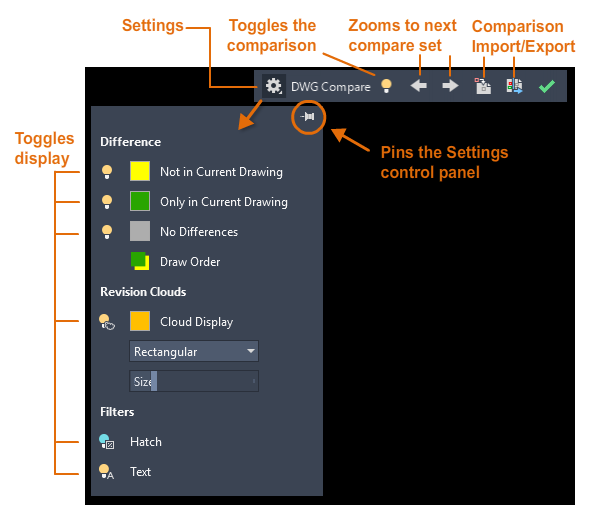 To facilitate direct editing in the compare state, the options and controls for this feature were moved from the ribbon to a docked toolbar at the top of the drawing area. Most of the options were combined into the Settings control and enhanced as shown. You can easily toggle the comparison from the toolbar and the display of the types of differences from the Settings control. Also, the default colors can easily be changed by clicking on a color for your preferences or for colorblind-friendly colors. In this illustration, the color for Not in Current Drawing was changed from red to yellow. The change sets are each surrounded by orange revision clouds, which are scaled to the drawing extents. 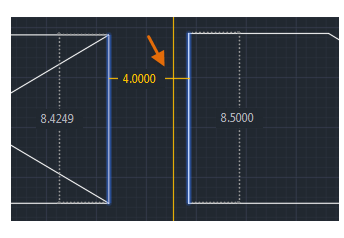 You can import the highlighted differences in yellow from the compared drawing into the current drawing. If you do so, these objects will now exist in both drawings and will automatically turn gray. Only the objects in the specified area that are not in the current drawing can be imported. You can also export both drawings into a new snapshot drawing that combines the similarities and changes between both drawings. The result of this operation is the same as a drawing comparison in AutoCAD 2019. The arrow buttons provide a way to step through each change set, automatically zooming in to each successive or previous change set. The following tables describe how certain objects are affected when imported during a comparison with drawings created using the AutoCAD Electrical and AutoCAD Mechanical toolsets. Wires will lose some properties such as color and size. The wire data is available in the project as layers and cannot be imported into the drawing comparison mode. The wire number is disconnected with the wire. The imported wire number will lose its relationship with the wire. The source and destination arrows imported will not have the correct wire numbers. The source arrows and the destination arrows will also lose their relationship to each other. These blocks will retain their electrical properties, however the terminal wire numbers will not be updated. The imported balloons will not be grouped and will be available only as exploded geometric objects. Importing a mechanical symbol that's attached to an object also imports the associated object. 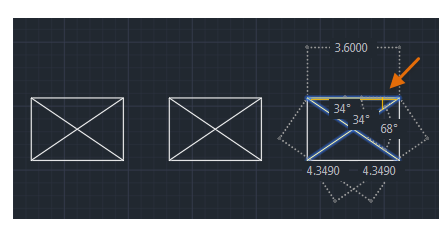 For example, if a weld symbol is attached to a rectangle, importing the weld symbol will also import the rectangle object. Importing a standard part will not update the Bill of Materials (BOM) unless you also select the associated part reference of the standard part. Importing an FEA object will not include its mechanical data and the object will be imported as a block. Collaborate tab > Compare panel > DWG Compare. COMPARECLOSE - Closes the Compare toolbar and exits the comparison. COMPAREEXPORT - Exports the comparison results into a new drawing, called a snapshot drawing, and opens the drawing. COMPAREIMPORT - Imports objects from the compared file into the current drawing. Only the selected objects that exist in the compared file and not in the current file are imported. Measuring has become much faster with the new Quick option of the MEASUREGEOM command. 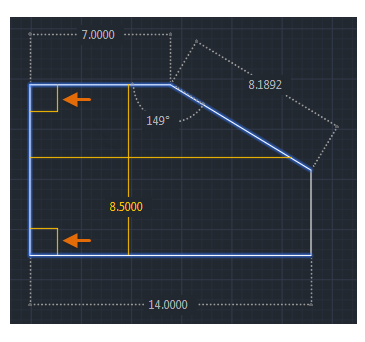 With this option, you can quickly review the dimensions, distances, and angles within a 2D drawing. When this option is active, the command displays dimensions, distances, and angles within a 2D drawing dynamically as you move your mouse over and between objects. The orange squares displayed at the left side of the illustration represent angles at precisely 90 degrees. The distance between the two objects is measured in the illustration below because they're parallel. Tip: To avoid quick dimension clutter and to improve performance, it's best to zoom into complicated areas. Home tab > Utilities panel > Measure/Quick. MEASUREGEOM - Adds the Quick option for real-time measurements. A new installation technology dramatically improves the install time on solid state drives (SSD), typically reducing the time by about half. Network access time to xrefs, blocks, and support files has been improved. Support files include those associated with hatches, tool palettes, fonts, linetypes, template files, standards files, and so on. The degree of improvement depends on the size and content of your drawing files and network performance. AutoCAD 2020 now supports cloud connectivity and storage with several cloud service providers when you use the Save, Save As, and Open commands. Depending on what you have installed, the Places list in AutoCAD file selection dialog boxes can include Box, Dropbox, and several similar services. Includes Xrefs with the drawing files that you save for AutoCAD web and mobile access. The CAD Manager Control Utility includes a new checkbox on the Online Content tab to disable the SAVETOWEBMOBILE and OPENFROMWEBMOBILE commands. This control has been added for sites that require their drawings to remain exclusively within their organization's network. AutoCAD now launches correctly with different DirectX drivers (Dx9, Dx11, or no driver), high resolution (4K) monitors, and dual monitors. In addition, the graphics display settings are consolidated into three modes, which includes gradient hatches and images. The graphics performance setting, Intermediate Mode, is updated to reset several display parameters automatically to optimize your display. Enter GRAPHICSCONFIG at the Command prompt. The Graphics Performance dialog box displays, shown in part below. GRAPHICSCONFIG - Revised 2D Display Settings as displayed in the Graphics Performance Dialog Box. -GRAPHICSCONFIG- Revised command line options that support the new 2D Display Settings. Following are highlights of the work completed in AutoCAD 2020 relating to cyber security. Due to the sensitive nature of some of these fixes, we've deliberately avoided providing overly specific descriptions. Four potential exploits in certain data files created by AutoCAD have been closed. Several dependencies on DLLs or other components used in AutoCAD with known vulnerabilities were removed or upgraded. A future vulnerability in a component is in process of being replaced. A potential server vulnerability has been closed with an upgrade.